Perry County Alabama, located in the west-central part of the state, was established in 1819 from land acquired from the Creek Indians in the 1814 Treaty of Fort Jackson. The county is named in honor of Commodore Oliver Hazard Perry of The United States Navy. The County seat is Marion Alabama. Civil-rights leader Coretta Scott King was born in Heiberger and attended Lincoln Normal School in Marion, which is also home to Marion Military Institute and the all-female Judson College. 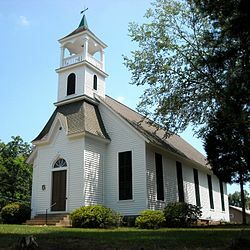 The church was organized in 1869 by freed slaves and the American Missionary Association. Marion Alabama is a growing city that combines the best of the “old” and “new” South. Tradition and craft, combined with the desire to grow as it develops its local resources into a better tomorrow. You’ll love Marion’s local cuisines, church services, antiques shops, and classic small city shopping and living. The cultures in Marion are harmoniously blended with a determination for a bright future. Located in West Central Alabama, Marion was established in 1817. Marion is the county seat of Perry County. Marion is adjacent to the Talladega National Forest and The Cahaba River lying beautifully along the scenic yet country highway views of Highways 5, 14, and 45.